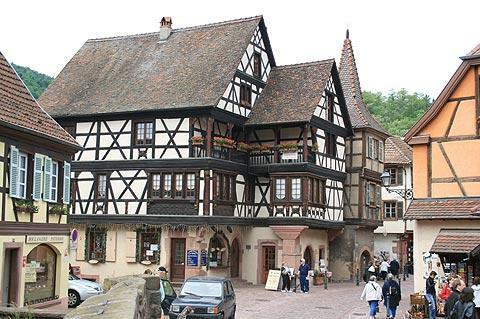 Kaysersberg is a small town between Riquewihr and Colmar in the Haut-Rhin department of the Alsace region. 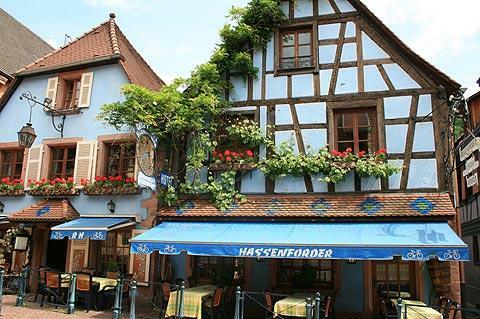 It is generally considered to be one of the most impressive of the Alsace towns, particularly in the town's medieval centre. The town is in a very picturesque setting, in a valley surrounded by vineyards and with forested hills rising above the town. As soon as you enter Kaysersberg you fnd the nice main square which is surrounded by lots of painted half-timber buildings, and a very pleasant main street. As you walk down the main street and reach the river this is where the town becomes really lovely. 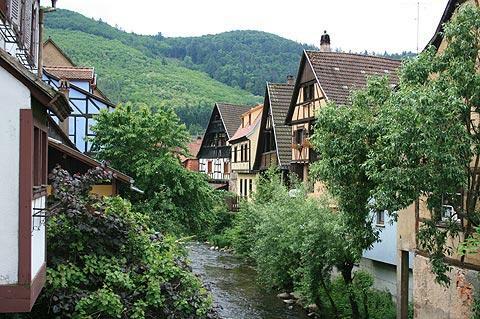 Along the edges of the river there are numerous brightly painted half-timber houses, and the Weiss river is crossed by a lovely 16th century fortified stone bridge further adding to the charming picture - delightful! Another notable landmark within the town is the 13th-15th century Church Sainte-Croix. The front facade is among the oldest parts of the church, and in roman style - enter the church through the ornately carved doorway to see the impressive 16th century altarpiece by Jean Bongart. You will see various other historical monuments as you explore Kaysersberg, many dating from the 15th century such as the towers, bridge and ramparts, and the 16th century town hall, each adding to the charm of the town. 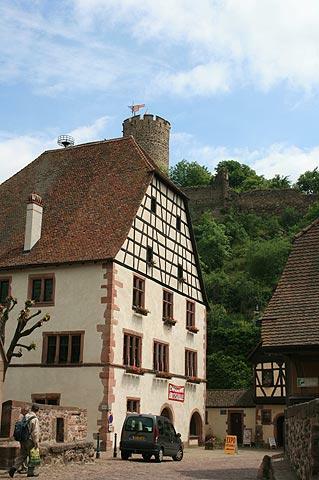 From many parts of the town you can see the ruins of the Chateau de Kaysersberg poised on the hill above the town. An important route passes through the valley here (the Col du Bonhomme) that has been defended since roman times, with the castle being built in the 13th century. In the following centuries this was a prosperous town, apart from the years around the time of the Thirty Years War. Many of the most imposing townhouses date from this period of prosperity with the 16th and 17th centuries particularly productive: for example the Maison Herzer, the Maison Faller Brief and the Maison Bohn were all built during the 10 years from 1591 to 1601 and are three of the grandest houses in Kaysersburg. See also Maison Loewert, which appears to be of a very similar style to these grand houses but was actually built much later, around 1739. You will quickly appreciate how difficult it is to accurately date houses when similar methods of construction were used for several centuries! When you have finished exploring the historical centre of Kaysersberg be sure to stop in a cafe, perhaps to sample Tokay, the local wine. Kaysersberg was also the birthplace of Albert Schweitzer, a winner of the Nobel Peace prize, whose life - and in particular his work establishing a hospital and leper colony for the poor in Africa - is commemorated in a museum. If you are visiting Alsace just before Christmas try and visit one of the Christmas markets held in Kaysersberg which are among the most popular in the region. 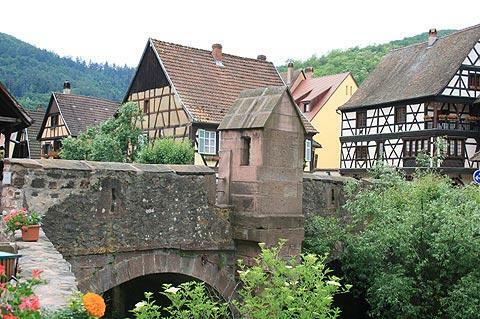 Kaysersberg is a town on the Alsace Wine Route, which is a popular way to explore the region that passes through many picturesque villages and many vineyard covered hills. 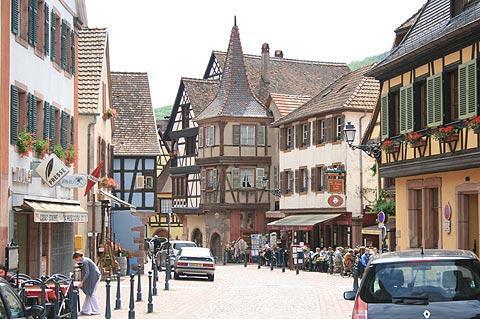 Of particular note close to Kaysersberg, the villages of Riquewihr and Hunawihr to the north-east of the town, and Eguisheim to the south-east are all classified among the 'most beautiful villages of France'. 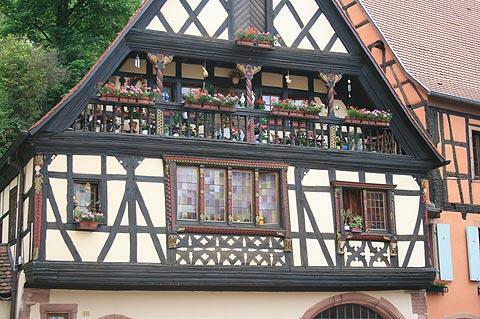 You can find more local travel ideas in the Haut-Rhin guide and the Alsace guide.